Welcome back to our series for budding entrepreneurs. If you’ve missed the parts on idea generation, testing those ideas and coming up with solutions – you can find them under the UX Daily tab on the site here. Today, we’re going to look at what to do with our first proposed solutions and how to test them with users before we invest large amounts of cash on turning them into something more. 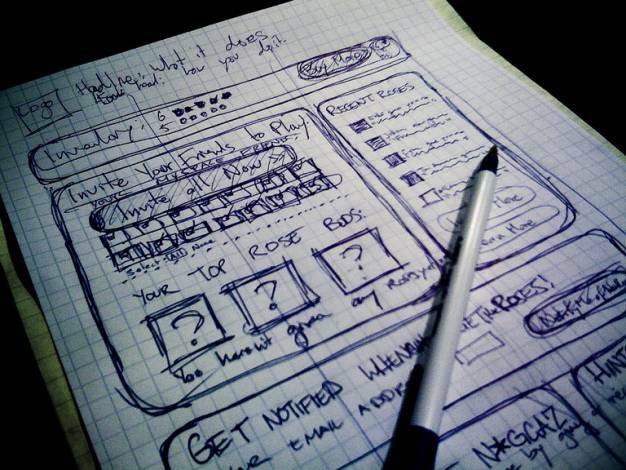 One of the most powerful user research tools you have for new ideas is the simple sketch. I know, a lot of people start grumbling about their artistic skills when you ask them to sketch – this is, however, a lousy reason not to sketch your ideas. The purpose of a sketch is to communicate what you’re going to do and how you’re going to do it – and how it will solve the problem in hand (either partially or completely – you may need more than one sketch if your solutions are a little more complex than a single action). Sketches are not there for demonstrating your artistic ability. You can, like me, use stick men and simple line drawings to convey your point. If you are an artist, that’s great and by all means make the sketch as pretty as you like but don’t forget that you still have to make it clear what your solution involves. Many years ago, I worked for a multi-million pound turnover software house. The original concept and the agreement between the two owners was drafted in the pub on the back of beer mats. Many of their idea generation processes in the following years would follow the same format. Nobody at that company was particularly artistic but it didn’t matter. Ideas are easy to come by and a sketch lets you test an idea without putting any real effort into it. Because it’s important to note – ideas are easy to come by because so many of them aren’t very good. Once you have your sketch; you can put it in front of your user(s). You should already have identified some potential users in your initial research. This gives you a chance to ask them what they think and whether your ideas appeal to them. Ideally, you want a more representative sample than a single user at this point – however, it’s better to test a sketch with a single user than none at all. You want to take useful feedback on board and document it. You may have some structured questions you need to answer about your idea but you also need to give users a chance to get creative with their feedback too – they may just save you a fortune in development costs.